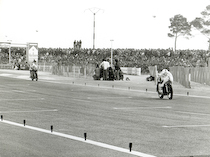 1973 - race | Yamaha Motor Co., Ltd.
View an archive of races Yamaha competed in 1973. J. Saarinen at the French GP. After withdrawing from GP competition in 1969, Yamaha returned with a factory team in the pinnacle 500cc class for the opening round of the season in April at the French GP. Honda had taken the manufacturer's title in this class in 1966, but had withdrawn from the GP after that. 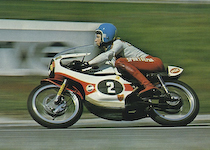 The 4-stroke MV Agusta was on a winning streak in the early 70's, as the 2-stroke teams were unable to match the speed of the 4-strokes. Now Yamaha brought in its first 500GP machine, the YZR500, into the series. It was ridden by Finland's Jarno Saarinen, who had won the championship on the prototype TZ250 the previous season, and the Japanese rider Hideo Kanaya. The development codename for the bike was 0W20 ("0W" was intended to be pronounced "Zero-W," but was generally known to people as O-W). Their main rival was Read, who had switched to MV Agusta prior to the season. In the 20-lap French GP at the Paul Ricard course, Saarinen crossed the finish line first to win Yamaha's debut in the 500cc class, What's more, he was a full 16 seconds ahead of the 2nd-place finisher, Read on MV Agusta's 4-stroke machine. Kanaya also finished well in third position. The second round in Salzburg a fortnight later showed the superiority of the YZR500 again, as Saarinen and Kanaya took a one-two finish. Saarinen ran a record-breaking lap time in the third round in West Germany. Although a broken chain kept him from winning the race, the Yamaha's performance in this class left a strong impression in the Gran Prix scene. A deeply tragic event took place in the fourth round in Italy, however. Soon after the start of the 250cc class race, which took place before the 500cc, the front running rider ran over an oil spill on the track and completely lost control of his bike. Saarinen, who was also racing in the 250cc class, could not avoid colliding with the fallen bike. The impact caused his body to fly midair and drop sharply onto the asphalt. Saarinen's helmet was split in half on impact and he was killed almost instantly. This tragedy caused the 250cc class race and the 500cc class race to be cancelled. After the accident, Yamaha ceased its factory participation in road racing as a sign of bereavement for this sad loss. Although the Yamaha team left the sport after the tragedy of the 500cc class, privateer racers on Yamaha machines delivered strong results in other categories. Finland's Teuvo Lasivuori took three wins in the 350cc class and this helped Yamaha win the manufacturer's title in the 350cc class for the first time. Dieter Braun, who rode a Yamaha production racer, won four races to clinch the rider's title. Yamaha also took the manufacturer's title, making this its fourth consecutive double title. This was also the seventh time that Yamaha took both the rider and the manufacturer titles since the start of its participation in this class. In the 125cc class, K. Andersson clinches the rider's title! In the 125cc class, Kent Andersson won five rounds to take his first-ever championship title. He was the third Yamaha rider to become the world champion in the 125cc class after Bill Ivy in 1967 and Phil Read in 1968. This also became the third time for Yamaha to win both the rider and the manufacturer titles.